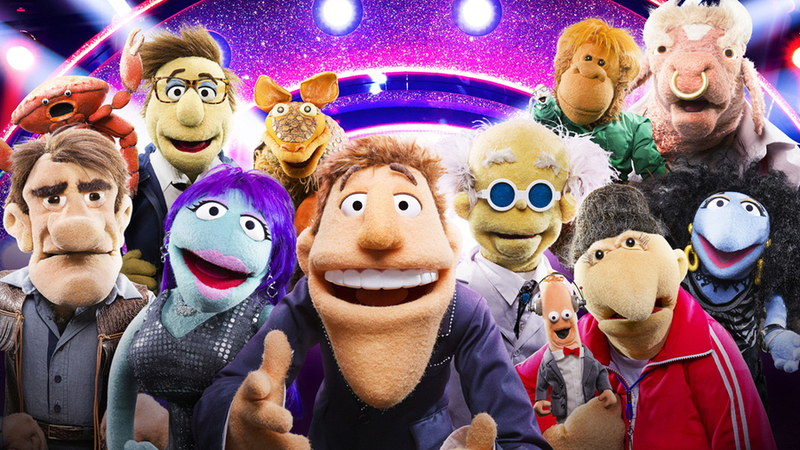 Welcome to That Puppet Game Show – a brand new entertainment programme from BBC In-House Entertainment and The Jim Henson Company coming to Saturday nights on BBC One. Hosted by Dougie Colon (pronounced ‘Cologne’), That Puppet Game Show is a glamorous Saturday Night programme like no other, combining puppet comedy and madcap games. Each week two top name celebrity contestants will complete in a series of games invented by a team of puppet experts with the winning celebrity will receive £10,000 for the charity of their choice. Each of the games has a different theme and is looked after by a different expert: Music with Eddie Watts, Sport with Jemima Taptackle, Nature with Jake Hamilton-Jones, Science with Dr Strabismus, Showbiz with Amber O’Neill and Mental Agility with The Amazing Ian. But it’s not just the games that make the programme like no other, there is also a glimpse into the backstage world too where we meet even more puppets who help the experts put the show together including the producer of That Puppet Game Show Mancie O’Neill plus Udders McGhee, the big boss. Each week the two celebrities will compete in five separate rounds, where they will play four different games from the collection of wild and wacky challenges below before facing off one last time in That Puppet End Game. Hosted by music expert Eddie Watts. Each celebrity has to put a line of singing hot dogs in the correct order so they sing a line from a famous song correctly. The first celebrity to get the hot dogs in the correct order singing the song correctly wins the points. Hosted by sports expert Jemima Taptackle. In this game, the celebrities race against each other to see who can punch out the most lights stuck to their bodies in the available time. Fasted celebrity wins the points. Hosted by mental agility expert The Amazing Ian. Here, the celebrities have to jump up and down behind a garden fence to see if they can spy what the hot dogs are getting up to on the other side. Ian will ask them a series of questions about what is going on and the nosiest neighbour will win the points. Hosted by science expert Dr Strabismus. The celebrities play against each other in a cross between ping pong and inter-galactic warfare, with each player trying to knock their opponents floating planets out of orbit to claim the points. Hosted by showbiz expert Amber O'Neill. Each celebrity has to read a speech from an autocue, sounds easy enough. However, the twist is that some of the words have been left blank. The player who fills in the most blanks correctly while they are performing their speech wins the points. Hosted by music expert Eddie Watts. In this game, the celebrities have to slow dance together and try and work out what song they are dancing to - the catch is the songs are being played ultra-slow. The player who gets the most songs correct wins the points. Hosted by nature expert Jake Hamilton-Jones. The celebrities take it in turn to fire darts at each other with a blow pipe, while the other is strapped to a spinning wheel, to see which player can hit the most targets and win the points. Hosted by mental agility expert The Amazing Ian. In this game, the celebrities each have to memorise the positions of their glowing balls in a ring of mostly non-glowing balls. The balls only glow when the lights are off, when the lights are on will they be able to find them? Hosted by science expert Dr Strabismus, the celebrities race to see who can blow out 100 candles before the other and win the points. Hosted by nature expert Jake Hamilton-Jones. The celebrities have to memorise a series of bird calls, return the call, and catch the egg laid by the bird in their bucket. The player who catches the most eggs wins the points. At the end of each episode, the celebrities will take part in That Puppet End Game hosted by the main man himself, Dougie Colon. Here, the celebrities face quick-fire questions on nature, science, sport, music, show business, and mental agility from all of our experts, in a final push to win the £10,000 charity prize. A whole host of top-name celebrities will be taking part in the show each week, hoping they can do their best to beat their opponent and claim the all important £10,000 for the charity of their choice. Celebrities taking part include: Jonathan Ross v Katherine Jenkins, Claudia Winkleman v Shane Richie, Vernon Kay v Mel Giedroyc, Tess Daly v Ronan Keating, Richard Hammond v Oritse Williams, Jack Dee v Alex Jones and Gary Lineker v Freddie Flintoff.